Master bedroom with work desk, smart TV, reading corner, A/C and closets. Open kitchen that integrates into the living room. Pic taken from terrace door. Fully equipped kitchen with all you need in order to cook a nice meal. Master bathroom with plenty of space. Shampoo and bar soap included. Guest bathroom with plenty of space. Shampoo and bar soap included. La Diva - one of many great restaurants in the neighborhood. Absenta and Roset are cool spots to hang with the local jetset. Cali's River Boulevard is hopping every Friday afternoon after work! Amazing top-floor apartment with 2-bedrooms, 2 bathrooms close to all the fun Cali has to offer! Brand-new penthouse apartment with all the bells and whistles. Located on a quiet, tree-lined street, yet just steps away from all the fun Cali has to offer. With enough room for 4 people, this is an ideal space for either a group of friends, a family or even executives fed up with the monotony of staying at a hotel. 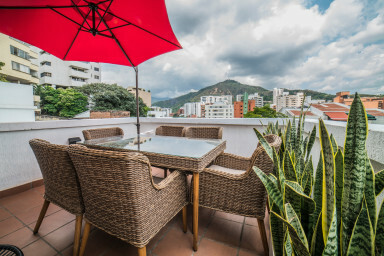 With two bedrooms and two bathrooms, an open kitchen, and TV/sitting area, and a terrace with amazing views, there's plenty of space to make you feel like home while visiting. All tabs have hot water, both bedrooms have A/C, smart TVs, and queen beds. All the amenities are in place whether you're looking to cook or just having some friends over for drinks. The living room furniture is high-end to ensure quality relaxation, and we are sure you’ll be impressed with the level of comfort, style, and sophistication the apartment provides. We are available 24/7 for any inquiries or questions you might have. Our office is located just around the corner as well. Upon making a reservation, you will receive access to our virtual guidebook helping you make the most of your time in the city. The building does not have any parking. Parking is allowed on the street, but we recommend using the secure public parking lot located one and half block away. Access to transportation is easy and the options include yellow taxis, Uber, and busses. All of them are metered (buses have a fixed price) so you need not worry about being overcharged.